This paper explores the physics of the what-if question “what if the entire Earth was instantaneously replaced with an equal volume of closely packed, but uncompressed blueberries?”. While the assumption may be absurd, the consequences can be explored rigorously using elementary physics. The result is not entirely dissimilar to a small ocean-world exo-planet. Here is the full analysis, via M.
“If you want more money get a better job,” reads one comment on a thread asking the bad tippers of the internet to explain themselves. “I don’t tip because society says I have to,” says Mr. Pink, the crook played by Steve Buscemi in the 1992 Quentin Tarantino film Reservoir Dogs. Here is the story, via Anecdotal. I spent two days once eating the food at Menlo Park Facebook, and thought it was quite good. I didn’t realize until recently that broccoli, Brussels sprouts, cauliflower, kale, cabbage, and collard greens are all technically the same species, Brassica oleracea. The substantial differences between these sub-species are all due to patient intervention by human farmers over millennia. Many of these changes are surprisingly recent. Early versions of cauliflower may have been mentioned by Pliny and medieval Muslim botanists, but as late as 1600, a French author was writing that cauli-fiori “as the Italians call it” was “still rather rare in France.” Likewise, Brussels sprouts don’t appear to have become widely cultivated until the Renaissance. That is from a longer post by Benjamn Breen at Res Obscura. And here is his post on when California was the Bear Republic. Juan is sometimes considered the world’s greatest hitchhiker, and this was one of my favorite installments in the series. We talked about “the joys of connecting with people, why it’s so hard to avoid stereotypes (including of hitchhikers), how stamp collecting guides his trips, the darkest secrets of people he’s gotten rides from, traveling and writing books with his wife, the cause of violence in the Americas, finding the emotional heart of a journey, where he’s going next…” and which country has the most beautiful women (and men). And why Colombia and Transnistria are two of his favorite places to visit. Here is the transcript and audio. VILLARINO: As a rule of thumb, I always like to say that you stop cars with your smile and not with your thumb. There are actually a lot of things you could do to improve your chances of getting a lift. For example, a driver has on average three seconds to decide whether he’s going to stop or not. He sees you, he’s driving maybe 80 miles an hour, and you suddenly pop out. There are a lot of things going on unconsciously through his mind to decide whether he’s going to stop or not. You have only these seconds to convey any message of trust, and so you have to do things. For example, one is smiling. The other one is, when you manage to get eye contact, then I reinforce. Let’s say, I’m showing my thumb, but I also switch my hand signal and point it to the direction in which I’m going as I’m smiling. This makes a more personalized link over the general link you are already doing, which is thumbing. Then the way you are dressed, the way your backpack is positioned . . .
COWEN: In your six slowest, you have in that worst six Sweden, Norway, Finland, Denmark with slow times [for being picked up hitchhiking]. COWEN: Those countries have plenty of cars. Why are they so slow? VILLARINO: That’s amazing. To be hitchhiking in Scandinavia, you see all this row of Volvo cars passing you by [laughs] and they will never ever stop. COWEN: Would you describe yourself as a workaholic hitchhiker? VILLARINO: Yes. [laughs] I am. People would be so surprised to see how much time there is involved on the backstage behind the screen because you hitchhike, you have books, and you have a blog. The blog is so time consuming. VILLARINO: Probably because in our evolution as territories, we have had violence as a part of it much more recently in the timeline. We were conquered by means of powder. I think that’s probably in the genetic of our culture. I hope not. Strongly recommended, and I hope to read and see more of Juan in the future. What should I ask Michael Pollan? I will be doing a Conversation with Tyler with him, no associated public event. Here is his home page, and the About section. Here is Wikipedia on Pollan. Here is a Sean Iling Vox interview with Pollan, on his recent work on LSD and other psychedelics, and his most recent book is How to Change Your Mind: What the New Science of Psychedelics Teaches Us About Consciousness, Dying, Addiction, Depression, and Transcendence. Pollan is perhaps best known for his books on food, cooking, and food supply chains. Restaurateurs who say they can no longer find or afford servers are figuring out how to do without them. And so in this city of staggering wealth, you can eat like a gourmand, with real stemware and ceramic plates. But first you’ll have to go get your own silverware. …Restaurateurs here have taken a model familiar to taquerias and fast-casual, cafeteria-style places like Sweetgreen and Chipotle Mexican Grill, and pushed it further up the fine-dining food chain. Call it fast-fine, they suggest, or fine-casual. Or counter service “in a full service environment” that includes $11 cocktails and $22 pan-roasted salmon. On July 1, the minimum wage in San Francisco will hit $15 an hour, following incremental raises from $10.74 in 2014. The city also requires employers with at least 20 workers to pay health care costs beyond the mandates of the Affordable Care Act, in addition to paid sick leave and parental leave. Members of White House press secretary Sarah Sanders’ family were followed by the owner of the restaurant they were kicked out of over the weekend after they settled an alternative place to dine. During an interview Monday on Fox News host Laura Ingraham’s radio show, former Arkansas Gov. Mike Huckabee, the father of the press secretary, said Stephanie Wilkinson, owner of the Red Hen restaurant in Lexington, Va., tailed Sanders’ in-laws across the street and along with a number of other people protested their presence at the restaurant to which they had migrated. Sanders and her husband were said to not be present at the second restaurant. Here is more. I still believe in freedom of association in matters such as this, but I also think you should, as a personal decision, serve Republicans at the lunch counter. This is what starts to happen when you don’t.. Civility remains underrated, and is this a good time to apply just a little behavioral economics to how the interactions might escalate. They display an inclination to secular/atheist views on religion matters (e.g., Humane Research Council , where it is shown that about half of the American community of vegans/vegetarians is not religious—a percentage that is considerably higher than that of the general population). Not by chance, of the mentioned 10%, one third dropped the lifestyle after 3 months or less, one half within a year, and therefore only less than 20% “resisted” for more than a year. That is from a recent article by Dario Martinelli and Aušra Berkmanienė. It seems, by the way, that Israel is the country with the highest measured percentage of vegans. Is that because it is a way of keeping semi-kosher without quite admitting one is doing so? Artificial meat? Yes, yes I know. But we already have cauliflower, and drenched in yogurt sauce and green cardamom pods and garam masala that is quite delicious, and yet it doesn’t seem to matter. Vegetarian food in India already tastes better than most meat dishes consumed in the United States. Hat tip goes to Rolf Degen. How much is deep sea fishing subsidized? Emphasis added, that is by Enric Sala, et.al., via Anecdotal. 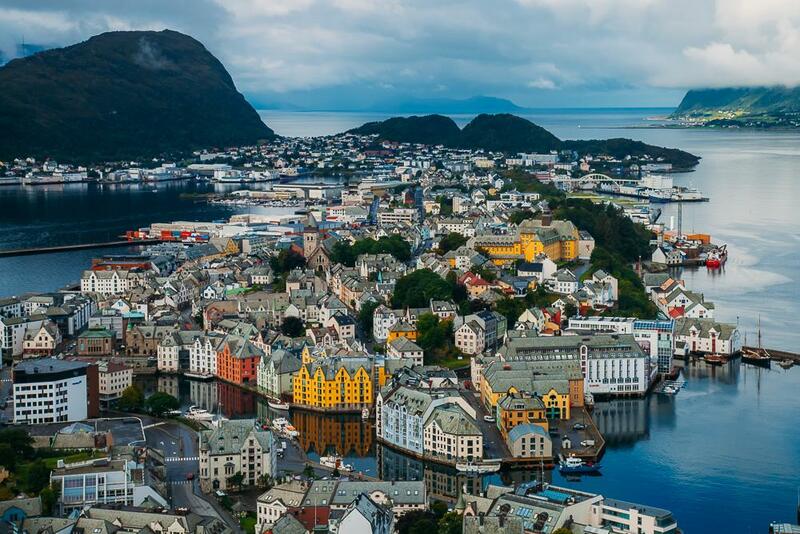 Alesund, Norway is one of the most beautiful small cities in Europe. The setting is picture-perfect, and much of the architecture was redone in 1904-1905 in Art Nouveau style, due to a fire that burned down the previous wooden structures. The Art Nouveau murals in the town church deserve to be better known. This time around, Norway seems vaguely affordable. The food is “good enough,” especially if you like cod. Dark chocolate ice cream is hard to come by. Driving to the puffins takes 3-4 hours, though they are not always to be seen. The price of vanilla has hit a record high of $600 (£445) per kilogram for the second time since 2017 when a cyclone damaged many of the plantations in Madagascar, where three quarters of the world’s vanilla is grown. Silver by comparison currently costs $538/kg. Demand for vanilla has kept the prices high, leading some ice cream manufacturers to cut back and even halt production of the flavour, sparking fears of shortages over the summer. Replacement printer ink cartridges can cost between $8 and $27, depending on the type of printer you have. A single black ink jet cartridge from one major manufacturer can cost $23 for just 4ml of ink – enough to print around 200 pages. Manufacturers argue they need to charge this to cover the loss they are selling the printer hardware at, together with the research and development they do on ink technology. But cut open an ink cartridge and you will see that most of the space inside is taken up with sponge, designed to help preserve and deliver the ink. And when you are paying what works out to be around $1,733/kg of ink, you might be better off printing with pure silver instead. Is there a Chinese salamander bubble? Bizarrely, only 3 percent of the animals raised by the farms are eventually sold to restaurants. The rest are sold to more start-up farms. This absurd amphibian Ponzi scheme so inflated the worth of the salamanders that a small, 2-kilogram individual could sell for around $1,500. As a result, people began supplementing the farmed stock by illegally collecting the animals from the wild. “The high prices created a sort of salamander rush,” says Jing Che from the Kunming Institute of Zoology, who was involved in the recent study. That is from Ed Yong, via Brian Slesinsky. There is much more at the link, definitely recommended.